Somerset, NJ (USA) – NEI Corporation announced today that the US Patent and Trademark Office (USPTO) has recently issued a notice of allowance to the company on two patent applications; one for a durable highly hydrophobic coating and the other for an adhesion promoting surface treatment. These patents complement NEI’s portfolio of patents pertaining to superhydrophobic, self-healing, and abrasion resistant coatings. With the allowance of seven patents, and the introduction of an array of coating products, NEI’s concerted efforts to develop and implement practical, multi-functional coatings have now come to fruition. There is great interest in functional coatings, for both industrial and consumer applications, where the coating or surface treatment provides functionalities beyond the usual protective and aesthetic properties. For example, self-healing coatings autonomously repair damage, hydrophobic coatings are able to vigorously repel water droplets, oleophobic coatings prevent “oil” molecules from sticking to the surface, self-cleaning or easy-to-clean coatings minimize or eliminate the need for chemicals during washing, and adhesion promoter surface treatments enable an ultra-strong bond between the primer and the surface. Commercial products to date have met with limited success because they are not engineered to meet all of the functional performance requirements that an application requires. NEI’s patented and patent-pending technologies address this market need. 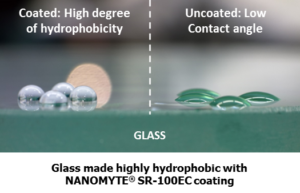 The recently allowed patent application describes durable hydrophobic coating compositions that are highly desirable for numerous applications, as they impart easy-to-clean and stain-resisting properties to surfaces. For aesthetic reasons, there is also a need for a thin, transparent, easy-to-clean coating that does not add excess weight and does not change the appearance of the substrate to be coated. The patented compositions are comprised of functionalized perfluoropolyethers (PFPEs), which are known for their non-stick and lubricating properties. It has been a major technical challenge to incorporate PFPEs into a stable formulation that can lead to a coating with sufficient adhesion to various substrates. The patent claims transparent and homogeneous compositions that overcome the stability and adhesion issues. The compositions result in a micron-thick, durable hydrophobic coating that cannot easily be removed by abrasion, harsh cleaners, or chemicals. The patent is the basis for NEI’s hydrophobic coating products, NANOMYTE® SuperCN and SR-100EC. The adhesion promoter patent application describes a chromate-free, surface pretreatment composition. 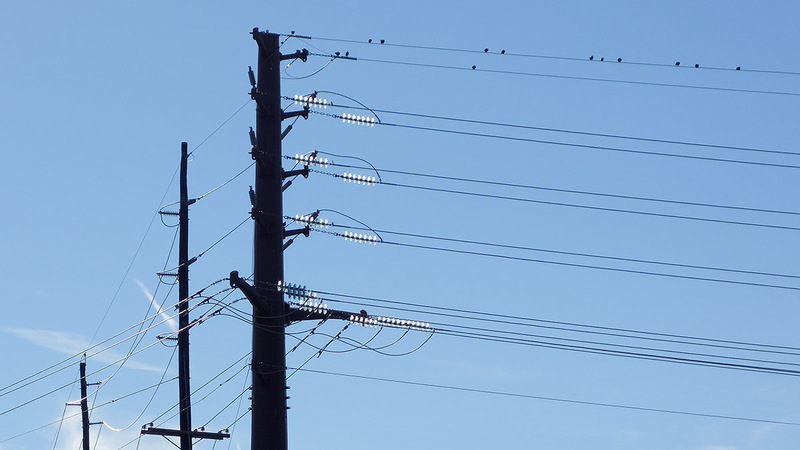 The environmentally-friendly, waterborne pretreatment promotes the adhesion between a metal substrate and an overlying paint layer by acting as a “double‐sided bonding agent,” while at the same time improving corrosion resistance. The novel composition comprises organo-functional silanes but functions differently from traditional silane treatments. The composition results in a thin film coating having a graded structure, i.e., an inorganic oxide layer that bonds strongly with steel and a loosely crosslinked top layer containing functional groups that can further crosslink with paint overlay. The new technology is valuable to applicators who paint metal structures, such as bridges, ships, and other steel structures. It is also applicable to industrial painting operations, such as coil and spray coatings. The patented chromate‐free pretreatment for steel, offered commercially as NANOMYTE® PT-20, represents a significant advancement in the state‐of‐the‐art for corrosion resistant technologies. NEI Corporation is an application-driven company that utilizes nanotechnology to develop and produce advanced materials. The company’s core competencies are in synthesizing nanoscale materials and prototyping products that incorporate the advanced materials. 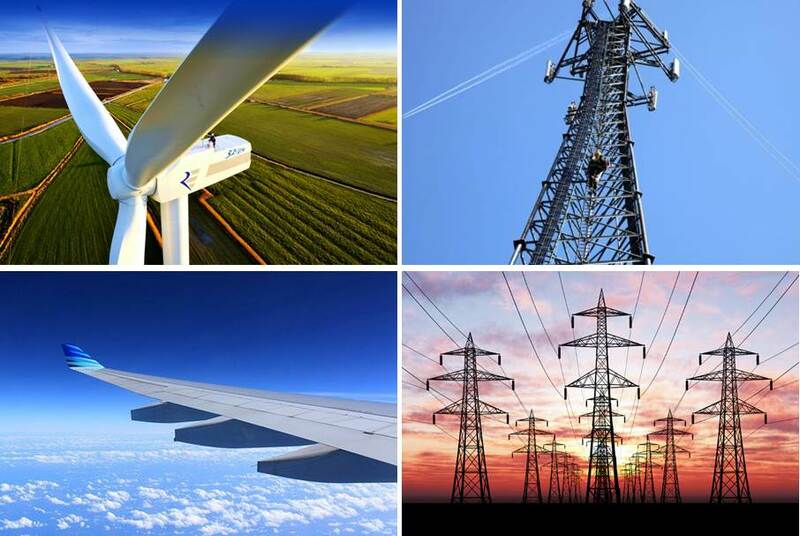 NEI offers an array of Advanced Protective Coatings for metal and polymer surfaces, which are sold under the registered trademark NANOMYTE® and are backed by a suite of issued and pending patents. The coatings have tailored functionalities such as anti-corrosion, self-healing, scratch resistance, ice-phobic, and self-cleaning. Somerset, New Jersey (USA) – NEI Corporation issued a product update today for NANOMYTE® PT-60, a patent-pending conversion coating with active corrosion protection functionality. Isolation strategies for fastening steel bolts on magnesium components include the use of aluminum shims and spacers. PT-60, presents an alternative where the cost associated with spacers can be avoided without sacrificing performance. Neutral salt spray testing of PT-60 treated magnesium, with a standard epoxy primer, exhibits better performance than the current practice. 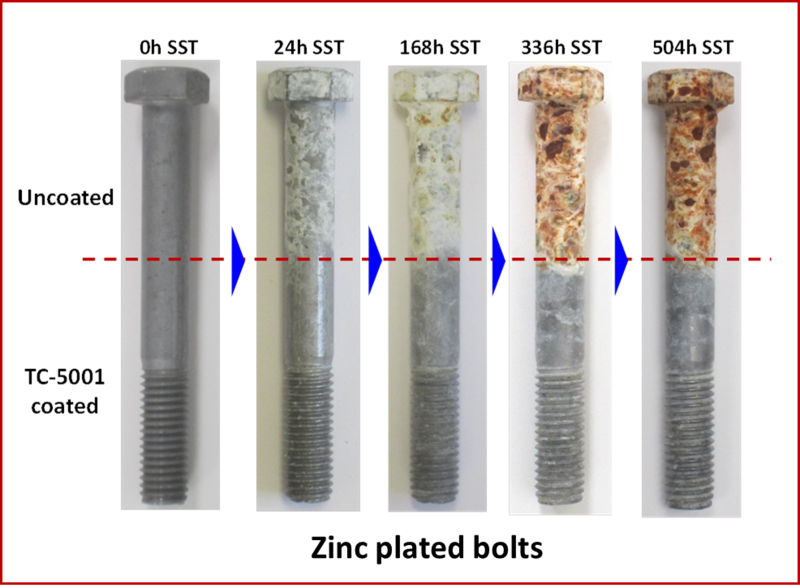 Tests show enhanced protection against galvanic corrosion between zinc plated steel bolt and magnesium substrate. Additionally, PT-60 significantly reduces general corrosion. Minimal corrosion build-up at the scribe demonstrates the self-healing corrosion inhibition mechanism at work. 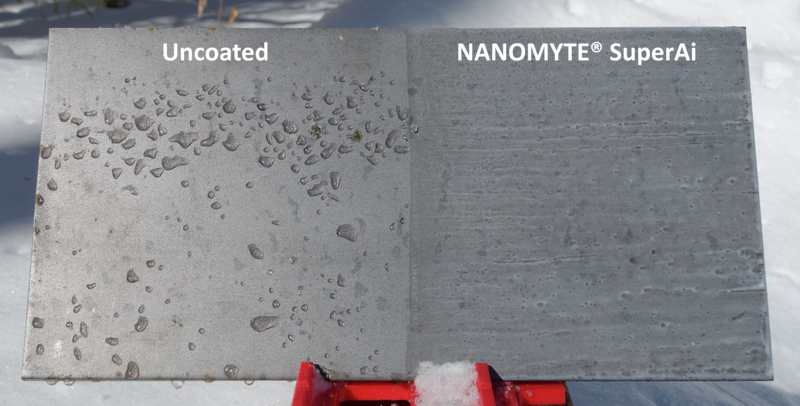 NANOMYTE® PT-60 is a chromate-free, self-healing conversion coating for magnesium that is a drop-in replacement for chromate. It can be applied as a thin conversion coating that protects the metal from corrosion, or as a pretreatment that improves adhesion with overlying paint. The coating is available in 1 liter, 1 gallon, & 55 gallon quantities. NEI Corporation is an application-driven company that utilizes nanotechnology to develop and produce advanced materials. The company’s core competencies are in synthesizing nanoscale materials and prototyping products that incorporate the advanced materials. NEI offers an array of Advanced Protective Coatings for metal and polymer surfaces. The coatings have tailored functionalities such as anti-corrosion, self-healing, scratch resistant, impact resistant, ice-phobic, and self-cleaning. Somerset, New Jersey (USA) – NEI Corporation announced today that it has introduced NANOMYTE® MEND-RT, a self-healing, polymer nanocomposite coating for use as an intermediate layer in coating systems on metal substrates. When the coating system is physically damaged, the self-healing intermediate layer repairs the damage autonomously at near ambient conditions, closing and sealing the gap and protecting the metal from exposure to the elements. This new feature of physical gap closing provides an alternative to chemical self-healing observed in chromate coatings. The universal nature of this new technology makes it applicable in any chromate-free coating system where self-healing is desired. 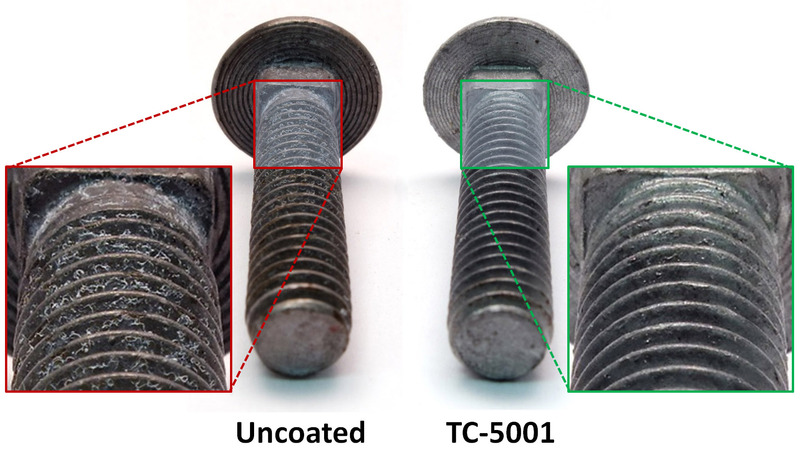 This unique feature can lead to preserving the aesthetics of a coated surface or providing active corrosion protection on metal surfaces, without changing the formulation of the conventional coating. The intermediate layer can be easily applied by dip, spray, brush or drawdown methods. The MEND-RT layer is introduced in a traditional coating system without deteriorating the original properties of the coating stack. The technology is applicable to coatings on both ferrous and non-ferrous metals and alloys, such as magnesium, aluminum, copper, zinc and alloys thereof, and steel. The efficacy of the NANOMYTE® MEND-RT coating was confirmed on aluminum alloys, which are used extensively in the aerospace industry. Two sets of coating systems were applied and compared for corrosion resistance. The first coating stack consisted of a chromate-free corrosion resistant pretreatment, a chromate-free epoxy primer, and a standard polyurethane topcoat. The second stack was identical to the first one, with the additional MEND-RT layer inserted between the primer and topcoat. 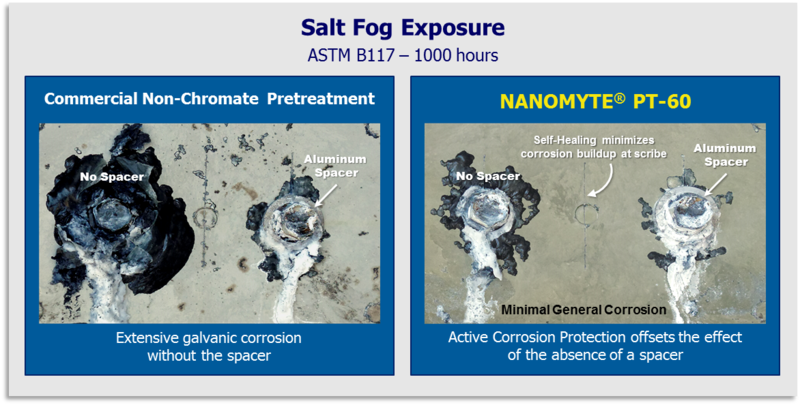 Corrosion resistance was evaluated using the Salt Spray Test (SST) ASTM B-117 method. Artificial defects were made on the coated panels before exposing them to salt spray. The first set of panels, i.e. without the self-healing inter-layer, exhibited early signs of corrosion with white corrosion buildup in the scribed region. The samples with MEND-RT showed enhanced protection with no signs of corrosion after 1,250 hours of exposure. 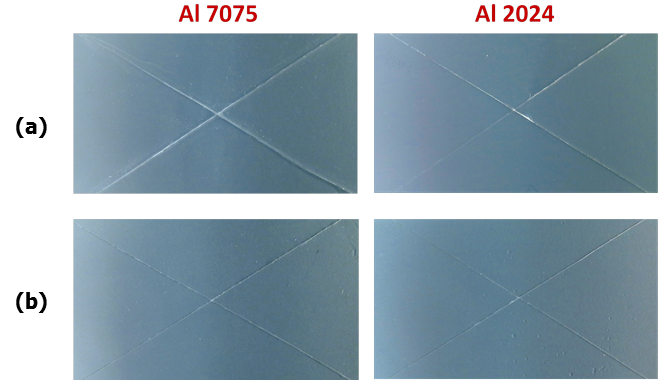 Photographs showing trends in corrosion resistance for Al 2024 and 7075 4” x 6” panels after 1,250 hours in salt spray test – (a) Commercial non-chromate coating system; (b) Commercial non-chromate coating system with NANOMYTE® MEND-RT. NANOMYTE® MEND-RT is available as a two-part product. Given that different applications utilize a variety of coating systems, NEI can undertake an in-house study to evaluate the efficacy of MEND-RT in the specific coating system used by the customer. If needed, the MEND-RT formulation can be customized to suit the requirements of the application. Alternatively, customers also have the option of purchasing MEND-RT and applying the coating at their facilities or through their vendors. A traditional protective coating system on a metal substrate generally consists of a pretreatment, primer, and a topcoat. The base metal is pretreated and primed for enhanced adhesion and corrosion resistance. A topcoat is then applied on the primer. Many of the coatings in use today to inhibit corrosion are “passive” in nature, in that they provide only barrier protection and/or promote adhesion between the metal and overlaying paint. While these are important attributes, passive solutions do not offer the same level of protection as coatings that provide “active” corrosion protection. To date, coatings that repair themselves when damaged are limited to either unconventional chemistries or uncommonly used polymers, which require forming a complex molecular network and are too soft to satisfy the mechanical robustness required in a protective topcoat. An “active” corrosion protection coating, or self-healing coating, can be categorized into two classes according to their self-healing mechanisms: chemical or physical. The traditional chromate-based corrosion protection coating uses hexavalent chromium either in the pretreatment or the primer, or both, to achieve chemical self-healing. In contrast, NEI’s self-healing coating involves physical gap closing and crack sealing, which has the potential to impart performance that matches that of a chromate-based system. Figure 1 illustrates the coating architecture containing NANOMYTE® MEND-RT, a self-healing intermediate layer between the topcoat and the primer. When the coating is physically damaged, the self-healing intermediate layer physically repairs the damage autonomously, closing and sealing the gap and providing an active physical barrier. Self-Healing Coating System Architecture – (a) A defect occurs in the coating system; (b) The self-healing coating, MEND-RT, closes the defect and prevents further crack propagation. 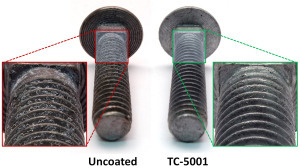 An obvious advantage with the use of a self-healing intermediate layer as shown in Figure 1 is that the topcoat is a standard topcoat, which satisfies all industrial standards. The main function of NANOMYTE® MEND-RT, the intermediate self-healing layer, is to self-repair damages. By separating the topcoat functions and the self-healing function into two distinct layers, a self-healing capability is added to the conventional coating system. The composition of MEND-RT is such that the adhesion between the primer and the topcoat is preserved. The MEND-RT layer can be introduced in any coating system, without deteriorating the original properties of the coating stack. 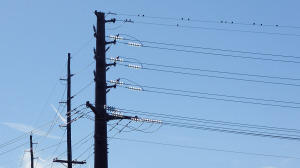 MEND-RT can be used with any coating system applied on ferrous or non-ferrous metals, such as magnesium, aluminum, copper, zinc and alloys thereof, and steel. The efficacy of the self-healing intermediate layer, MEND-RT, was verified using the standard accelerated test method. A chromate-free, self-healing coating system was applied on aluminum 2024 and 7075 alloys. 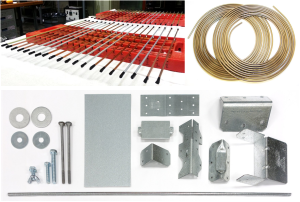 Aluminum was selected for this evaluation as it is extensively used with chromate coatings in the aerospace and aircraft industry due to its high strength and light weight. Two sets of coating systems were applied and compared for corrosion resistance. The first coating stack consisted of a chromate-free corrosion resistant pretreatment, a chromate-free epoxy primer, and a standard polyurethane topcoat. The second stack was identical to the first one, but had MEND-RT inserted between the primer and topcoat. Corrosion resistance was evaluated using the Salt Spray Test (SST) ASTM B-117 method. Artificial defects (“X” shaped scribes) were made on the coated panels before exposing them to salt spray. The photographs in Figure 2 show the progression of corrosion on Al 2024 and 7075 coupons after 1,250 hours of SST. The first set of panels, i.e. without the self-healing interlayer, exhibited early signs of corrosion with white corrosion buildup in the scribed region. The samples with MEND-RT showed enhanced protection with no signs of corrosion. Examination under the microscope revealed that the defects in the coating were physically sealed by the MEND-RT coating. In addition, the gap closing occurred at near ambient temperature, without any external heat or other stimuli. This is direct evidence that the introduction of MEND-RT enhances the corrosion resistance of a coating system, leading to a longer lifetime of the coating.